“We are proud of the diversity and inclusion initiatives already in place at American, but we know we can do even better. So, we viewed the feedback as an opportunity,” CEO Doug Parker said in a letter to staff at the time they announced implementing the changes. “American Airlines can set a new standard in corporate diversity and inclusion, and we are humbled by the opportunity before us to do so.” At the time, there were a lot of questions regarding exactly what these changes would entail, but we have a more concrete idea of the changes it has made. These include diversity and inclusion gap research; implicit bias training for the airlines’ 130,000 employees; and the launch a discrimination complaint resolution process for workers and customers. Part of what led to the ban in the first place was a slew of high-profile cases of black passengers being mistreated on American Airlines flights. Activist Tamika Mallory was thrown off a plane following an argument about seat assignment, saying that; “white male aggression” was on display. Rapper Joey Badass also called racial profiling when he was told by a flight attendant in January that he “didn’t belong” in first class. 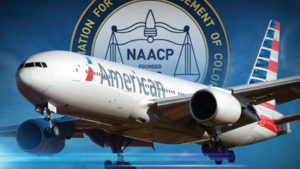 American Airlines had also been on top of the aviation industry in terms of discrimination complaints. While the lift of the ban is a good sign, the real proof will come moving forward if the company has a proper culture change.